(Nanowerk Spotlight) It's not quite like in Isaac Asimov's science fiction classic Fantastic Voyage, where five people travel in a submarine inside a person's blood stream, but scientists have talked for quite some time about micro and nanorobotic devices that can travel inside the human body and carry out a host of complex medical procedures such as monitoring, drug delivery and cell repair. Recent developments in micro- and nanoscale engineering have led to realization of various miniature mobile robots. It turns out that the most significant bottleneck for further miniaturization of mobile robots down to micrometer scale is the miniaturization of the on-board actuators and power sources required for mobility. Nature has already provided remarkable solutions to this problem by evolving chemically powered molecular motors. Such biomotors seem to be one of the most promising choices for on-board actuation. They are advantageous over man-made actuators because they are much smaller in size and are capable of producing more complicated motions. More importantly, they convert chemical energy to mechanical energy very efficiently. However, the major drawback of biomotors is that isolating and reconstituting them are complicated tasks with low yield and it is difficult to interface them with electronic circuitry. This has led scientists to successfully experiment with a new approach by using flagellar motors (the propulsion system of bacteria), still inside the intact cells, as actuators. 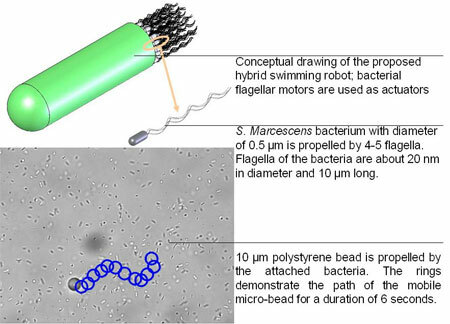 "We demonstrated the feasibility of using bacterial flagella as bioactuators by propelling 10 µm polystyrene (PS) beads with several S. marcescens bacteria attached to them" Dr. Metin Sitti explains to Nanowerk. "The used biomotors are still inside the intact cell which has several advantages: there is no need for purification and reconstitution; simple nutrient such as glucose is provided and ATP (adenosine triphosphate) or ion gradients are generated by the cell. Most importantly, sensors are already present in the cell and integrated with the motors. Lastly, more complex organelle can be used; hence more sophisticated motion can be generated." Sitti is associate professor at the Department of Mechanical Engineering and Robotics Institute at Carnegie Mellon University. Together with PhD student Bahareh Behkam he published a recent paper, titled "Bacterial flagella-based propulsion and on/off motion control of microscale objects", in the January 8, 2007 issue of Applied Physics Letters. They two maintain a project page about their swimming microrobots at the NanoRobotics Lab's website. Sitti points out that, although there have been examples of using bacteria or algae as nano-actuators by Howard Berg's and George Whitesides' groups at Harvard recently, there has been no work using these actuators for micro-robot propulsion and controlling their motion on/off using chemical stimuli. Sitti and Bekham show in their experiments that several bacteria, randomly attached to a 10 µm PS bead, produce a large enough propulsion force to propel the bead forward. On/off motion control of the bead is achieved by introducing copper ions and subsequently EDTA prompting the bacterial flagellar motor to halt and resume motion without causing any damage. This method of motion control is reversible and can be used repeatedly. Bacteria demonstrate immediate response to the metal ions and chelating agents. However, when the sample volume is large, the response time is affected by the diffusion rate of both chemicals. This problem can be overcome by local introduction of the chemicals. Sitti notes that the mechanism of adhesion of bacteria to surfaces is not well understood, though it is speculated that the bacteria adhesion occurs in two steps: (1) Reversible adhesion first occurs within few seconds. This is due to van der Waals, electrostatic forces, or acid-base interactions. (2) Irreversible attachment happens after the reversible attachment is made. In their experiments, the researchers observed that bacteria in a motility medium randomly interact with the microbeads and sometimes attach to them. "Different beads demonstrated different behaviors" says Sitti. "Some of the beads did not have any bacteria attached to them and were not mobile. For the 35 experiments performed, on average, 60% of the beads were mobile." Although significant displacement of the PS bead was consistently observed, the net displacement and speed of the beads were not identical across multiple experiments. Firstly, this is largely due to the fact that wild type bacteria were used in these experiments, and their flagellar motors demonstrate random "run" and "tumble" behavior. In addition, for any given bead, there are different number of bacteria attached to the bead and flagellar motors of each bacterium demonstrate different behaviors at any instant in time, hence it would be nearly impossible to have two beads move on similar paths. Second, orientation and spacing of the adhered bacteria was not controlled. After demonstrating the propulsion of the bead by bacteria, devising a speed control technique was the next significant step towards developing a microscale robotic system. Chemical and optical stimuli can be used to modulate the speed of the bacteria but neither of these two stimuli can cause the flagellar motors to halt. Sitti and Bekham used the fact that the absence of a chelating agent in bacterial suspensions leads to paralysis of the bacteria. A chelating agent is a substance whose molecules can form several bonds to a single metal ion. The reason for this phenomenon is that heavy metal ions, naturally present in water, bond to the rotor of the flagellar motors of the bacteria and prevent their motion. "By taking advantage of this fact the bacteria are purposefully paralyzed only temporarily and in a reversible fashion" says Sitti. "It is important to note that contrary to the chemical stimuli which interact with chemoreceptors causing them to signal to the motor to modulate its speed, heavy metal ions directly bond to the rotor of the flagellar motor, impairing its motion instantaneously." To resume the motion of the bead, an EDTA solution was added and the PS bead resumed its motion immediately. "We are aiming to fabricate micronscale swimming robots to swim inside low velocity and stagnant liquids of the human body" says Sitti. "This propulsion method will be used to develop hybrid biotic/abiotic swimming microrobots for potentially biomedical applications such as noninvasive screening for diseases and targeted drug delivery within areas of the body with stagnant or low velocity fluid flow. In addition, we could use them inside tiny pipes such as in nuclear plants and space shuttles to detect leakages." Although these results are very promising first steps toward a swimming microrobot, there is a lot of work to be done. "We are at the very beginning stage of the robot 1-D propulsion" Sitti says. "We need to steer the beads in 3-D, and fabricate and integrate onboard on/off chemical stimulus control system (using micro-fluidic channels and valves), CMOS electronics based simple processor and sensors, and wireless communication type of micro-components on the robot body to build a complete hybrid robot, and conduct biomedical applications. "